While obtaining regulatory approvals are a service The Planning Studio can assist clients with and is pleased to offer to clients, because the majority of our work is international in nature, we seldom get involved in project approvals and local regulations. But, we did have one project that was a master planning project, but it was also all about planning approvals. In 2002, we were referred to a client based in McKinleyville, California. The client, Dan Johnson of The Danco Group and his partner had just purchased an entire company town. The town, Samoa, was a former lumber town which was founded in the late 1800’s and was called the Vance Company Sawmill. In 1900 the mill was purchased by Hammond Lumber Company who operated the mill until 1956 when Georgia Pacific bought the Samoa Sawmill Complex. Hammond Lumber also built up the town adjacent to the mill to house their employees. A true “Company Town”, Samoa consisted of 174 acres of land, slightly more than 100 homes, The Samoa Cookhouse, The Samoa Post Office and a town mercantile, named “The Samoa Block”. The mill facilities were last used in 1980. The Samoa Pacific Group purchased the town in 2001. The initial purchase included 65 acres of land and all of the structures in Samoa. The Samoa Pacific Group also purchased an additional 150 acres of land in September 2001. They also held an option on another 200 acres of natural resource land along the coast north of the town. Shortly after purchasing Samoa, Samoa Pacific Group retained The Planning Studio to prepare a master plan for all of the existing facilities as well as a new business park and conference center and spa, and 274 new residential units. The other amazing existing building in the town is the Hostelry, which was originally the sawmill owner’s residence. It is located near the center of town. It contains a living room, kitchen, two dining rooms, a sitting room, approximately 6 bedrooms and three bathrooms. During the planning process, it was not occupied so it served as the planning team’s accommodation, our meeting space and our overall headquarters. We held almost all of our meetings in one of the dining rooms, which, since it was located at the center of town, was ideal if any questions came up regarding anything in the town. If something came up, we could pause our meeting and go for a walk to see what the answer to the question actually was. The Samoa Cookhouse still sells family style meals all day and provided a very convenient place to get our meals on-site. 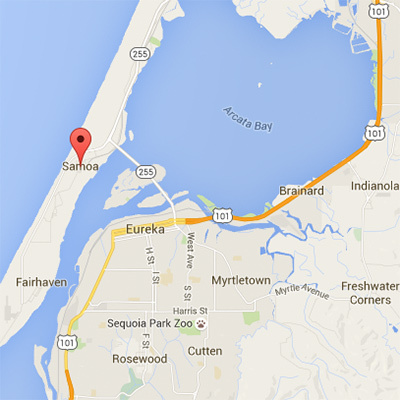 Samoa, California is located on a peninsula of land between the Pacific Ocean and Humboldt Bay approximately 3 miles from the town of Eureka. Because of it’s location between the ocean and the bay, in order to implement The Planning Studio’s master plan and before the project could be constructed, there were a number of regulatory approvals required from Humboldt County, including a “Project Description” which included a Local Coastal General Plan amendment, a Zoning Plan amendment and a Subdivision approval. Also required were a Planned Unit Development permit, a conditional use permit due to a new sewage disposal area. A detailed Environmental Impact Report was required and the project also needed approval of Coastal Development Permit from the California Coastal Commission, probably the most difficult permit approval of the bunch. The California Coastal Commission was established by voter initiative in 1972 (Proposition 20) and later made permanent by the Legislature through adoption of the California Coastal Act of 1976. In partnership with coastal cities and counties, throughout the state of California, The Coastal Commission plans and regulates the use of land and water in the coastal zone. Development activities, which are broadly defined by the Coastal Act to include (among others) construction of buildings, divisions of land, and activities that change the intensity of use of land or public access to coastal waters, generally require a coastal permit from either the Coastal Commission or the local government. The Coastal Act includes specific policies that address issues such as shoreline public access and recreation, lower cost visitor accommodations, terrestrial and marine habitat protection, visual resources, landform alteration, agricultural lands, commercial fisheries, industrial uses, water quality, offshore oil and gas development, transportation, development design, power plants, ports, and public works. The policies of the Coastal Act constitute the statutory standards applied to planning and regulatory decisions made by the Commission and by local governments, pursuant to the Coastal Act. On land the coastal zone varies in width from several hundred feet in highly urbanized areas up to five miles in certain rural areas, and offshore the coastal zone includes a three-mile-wide band of ocean. The coastal zone established by the Coastal Act does not include San Francisco Bay, where development is regulated by the Bay Conservation and Development Commission. The Planning Studio worked with and assisted the Samoa Pacific Group for a total of seven years, all the way through receipt/approval of the Coastal Development Permit. Which, was a very rare unanimous yes vote in the project’s favor! The client, Dan Johnson was one of the most open developers we have ever worked with. All through the master plan process and then on into the governmental approvals process, he was very open and honest with the public and the people in the surrounding communities. As a client, he was always forthcoming and honest with us and listened to all of our ideas and most of our suggestions. As a result we assisted in hours and hours of workshops and constituency meetings to get input from the community and keep them informed as to what was being planned. We received an amazing amount of input from residents, constituents and government officials. We constantly tried to incorporate their comments and concerns in order to improve our master plan and gain the necessary approvals in the timeliest manner possible. The Planning Studio can assist clients with not only master and site planning, but with complex project approvals and permitting, as well as the preparation and approval of environmental impacts reports.